Acción Democrática Cubana is geared toward supporting and promoting civil society in Cuba, especially groups defending human rights on the island. American Museum of the Cuban Diaspora showcases the history, culture, and contribution of the Cuban diaspora to the arts and humanities. CNC was founded in Washington, D.C., in 1972 by a small group of Cuban-American professionals concerned about the future of Cuban Americans. Initially named the Cuban National Planning Council, CNC was the first nonprofit organization conducting research on the demographics and socioeconomic needs of Cubans in the United States. CubaOne Foundation offers a new generation of Cuban Americans the opportunity to give back to Cuba, build relationships with the Cuban people, and explore their heritage through high-impact trips to the island. Cuba Study Group is a nonpartisan organization that seeks to facilitate peaceful change in Cuba leading to a free and open society, respect for human rights and the rule of law, a productive, market-based economy, and the reunification of the Cuban nation. Cuban American Association of Civil Engineers Inc. (CAACE) is designed to assist members in the maintenance of the highest professional engineering skills. Cuban American Bar Association (CABA) is a nonpartisan association established in Miami in 1974, whose mission is to improve the legal profession through greater diversity and equality of opportunity throughout Florida. Cuban-American CPAs Association is an organization of certified public accountants united by heritage. Established in 1980, the association provides leadership on issues affecting the accounting profession. Cuban American Veterans Association is dedicated to promoting the welfare of Cuban-American veterans. Cuban Americans for Engagement (CAFE) is a community organization of Cuban Americans and American citizens from throughout the United States that advocates for the pursuit and implementation of a new relationship between the U.S. and Cuba based on principles of exchange, engagement, normalization of relations, and diplomacy. Cuban Studies Institute preserves and disseminates the history and culture of Cuba; provides research and information about contemporary Cuba, U.S.-Cuba relations and Cuban-Americans; and prepares for change in the island. Directorio Democrático Cubano works for democracy in Cuba by way of a civic, nonviolent struggle that includes humanitarian and material support for pro-democracy organizations in Cuba, exchange of information with the Cuban people, and international solidarity with the pro-democracy movement in Cuba. Free Cuba Foundation is a nonpartisan organization whose purpose is to work towards the establishment of an independent and democratic Cuba using nonviolent means. National Association of Cuban-American Educators (NACAE) includes educators from all levels, from elementary to university teaching, and all disciplines in the humanities as well as the sciences. Raíces de Esperanza (Roots of Hope) is an international network of students and young professionals working to inspire young people across the globe to think about Cuba and proactively support their young counterparts on the island through innovative means. San Carlos Institute was founded in 1871 by Cuban exiles of Key West as an educational, civic, and patriotic center. Brothers to the Rescue is a pro-democracy, humanitarian organization that promotes and supports the efforts of the Cuban people to free themselves from dictatorship through the use of active nonviolence. Center for a Free Cuba is an independent, nonpartisan institution dedicated to promoting human rights and a transition to democracy and the rule of law on the island. Cuban American National Foundation is an advocate for a nonviolent transition to a free and democratic Cuba, a nation that fosters economic prosperity with individual equality and social justice for all. Inspire America seeks to inspire freedom in Cuba and the Americas. Inspire America visits with world leaders, prepares policy proposals, coordinates TV ad campaigns, conducts polls, and supports pro-democracy groups. Madres y Mujeres Anti-Represión (M.A.R.) por Cuba was established in Miami in 1994. The women of M.A.R. are dedicated to promoting democratic values and increasing awareness of human rights violations on the island. 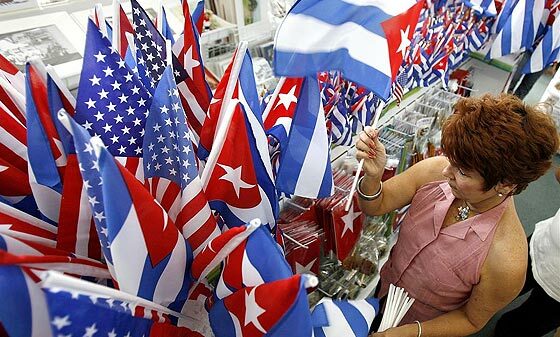 New Cuba PAC is a nonpartisan, federal Political Action Committee established to support federal candidates who champion legislation focused on helping the Cuban people and advancing the national interests of the United States through the lifting of trade and travel restrictions toward Cuba. US-Cuba Democracy PAC is a federal Political Action Committee formed to promote an unconditional transition in Cuba to democracy, the rule of law, and the free market.